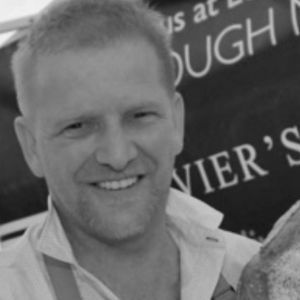 At the heart of our traditional French bakery is Olivier Favrel. With more than three decades of experience under his belt, our master baker and pastry chef is committed to crafting products made using only the best ingredients. Raised on the noble Brittany diet of buttery croissants and crusty bread, the young Olivier was a passionate soul, with a taste for the finer things in life. His love for quality food began early on, developing into an uncompromising commitment to excellence. Olivier then pursued a career as an apprentice patissier, learning the myriad inherited skills and techniques that go into this art form. In 1999, Olivier packed his bags and crossed the Channel to London, embarking on a new adventure. He worked for some of the biggest names in the capital, from the renowned Patissier ‘Didier’ to the then newly refurbished ‘Bluebird’ in Chelsea. In 2001, he was head-hunted by Flour Power City where he worked his way up the ranks, becoming one of the core team players behind the business’ dazzling achievements. Opened amidst London’s autumnal mahogany shades in 2011, Olivier’s Bakery was an immediate success, with markets sprouting up across the city including the capital’s most renowned food and drink hub and hallmark of quality, Borough Market.